A version of this article first appeared in Equals, a journal published online by the Mathematical Assocation, which can be found here. You may want to begin with the investigation Bracelets which engages pupils in number patterns, symmetry, factors, multiples, algebra and shape work, and gives them opportunities to be creative. Using 18 counters to start with, can they design bracelets, making sure there is a ‘hole’ in the centre for someone’s wrist? How about using more counters? 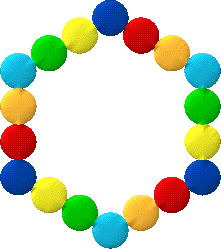 Might it be possible to design two identical bracelets with a given number of counters? What is the smallest number of counters that allows you to do this? Whatever design you create, how many counters would you need for the ‘next design up’? What are good numbers of counters to use? Why? Would differently-shaped counters lead to different explorations? If you wish to continue with a spatial focus, try playing Square It against the computer. Players take it in turns to click on a dot on the grid – the first player’s dots will be red and the computer’s will be blue. The winner is the first to have four of their own colour dots that can be joined by straight lines to form a square. Having played against the computer, pairs can have a go against each other using a grid and counters. Not only is this game a fantastic way to reinforce the properties of a square (pupils are often surprised when the computer wins by drawing a tilted square), there is also the strategy to think about. Asking about the best place to start the game can lead into a systematic enquiry focusing on the number of possible squares from each dot. Does the strategy differ on a larger/smaller grid? Introduce another strategy game, Nim-7. Players take it in turns to take either one or two counters from a pile of seven. The player who takes the last counter wins. Challenge learners to find a winning strategy. Does it matter who has the first turn? What happens when you start the game with more counters? How would you play to win if the loser is the person to take the last counter? You could always investigate other versions of Nim which use counters, which can be found here. 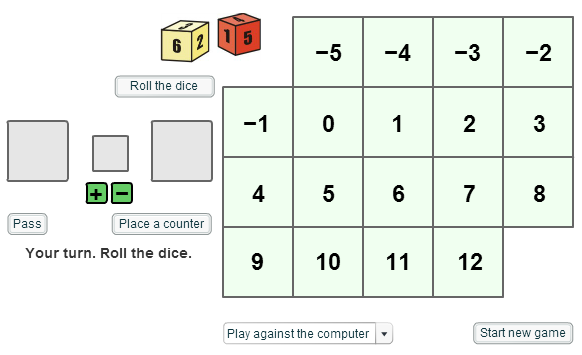 For a dip into calculation, probability and strategy, introduce learners to the games First Connect Three and Playing Connect Three. Whole-class discussion can focus on emerging strategies, observations, explanations and justifications. Are there some numbers that we should be aiming for? Why? Which numbers on the grid are the easiest to get? Why? Which numbers are most difficult to get? Why? Where Can We Visit? offers opportunities to explore fundamental ideas about number theory in a simple context. Counters in the Middle is one of a series of activities which encourage the development of team-building skills such as sharing reasoning, allowing everyone to contribute and valuing those contributions, and coming to a consensus.